A few months back, I remember finding a pack of Confex Baseball Enquirer at a dollar store. I was all excited because I figured it would be a pack missing from APTBNL. Well, as you see from the link, a pack was posted over 3 years ago. But the pack wasn't a total loss - I was able to add a new card to the broken bats binder. When I went to my Zistle account to add the card, it was missing from the database. No biggie. Now, as you can tell from the front, the cards have no identifying player information anywhere on them. If you take a look at the pack at APTBNL, you see the reverse is simply a fake interview with the player. This is all you have to go by to ID whom the person is on the front. 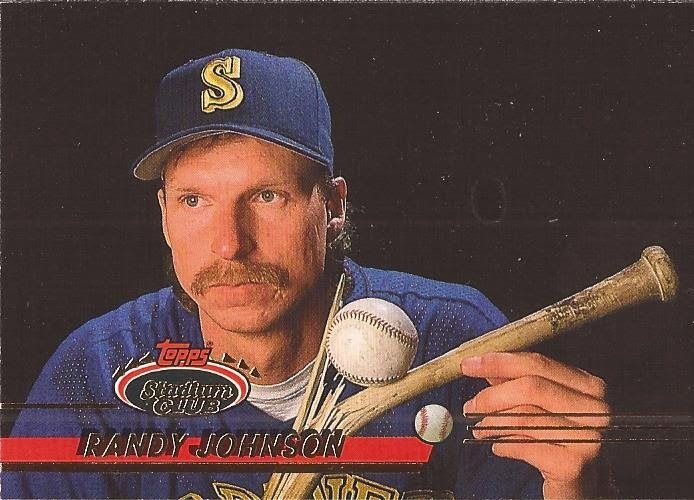 This card is a no brainer - Randy Johnson, right? "K" on the cap, broken bat, mustache and shaggy hair. 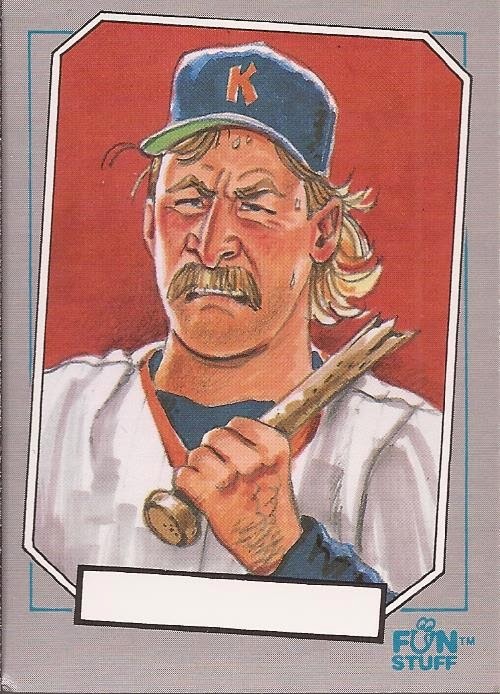 Even a few checklists online list this card as Randy Johnson. He even has a broken bat card from 1993 SC. But something bugged me. Read the back. To me, those questions are asked to someone that strikes out at the plate, not a pitcher that strikes out batters. 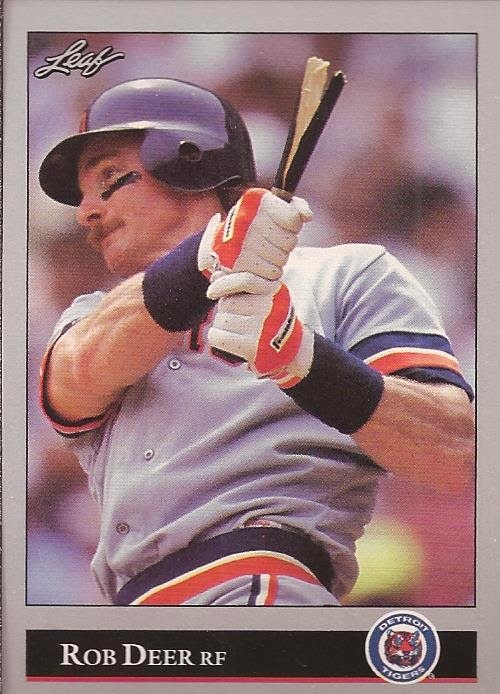 Johnson was with the Mariners in 1991 - DH prevented him from having any plate appearances in that year. In fact, he had only 18 at bats before 1991, while with the Expos. Nine total strike outs. So why were so many checklists saying this was Randy Johnson? It clearly wasn't, in my opinion. Luckily, one site came through with a better answer - TeamSets4U. If you have never been there, it is a great site for finding team checklists for a TON of releases. TeamSets4U came through and ID'd the player as Rob Deer with the Tigers. And that made sense. Deer lead the league, or was at the top of the league, in whiffing through his 11 seasons, leading the AL 4 times. When he retired, he had the worst (or best, however you look at it) strike out ratios in the history of MLB, going down on strikes every 2.75 at bats. Maybe they went a little generous with the hair, but I think the Enquirer card is Deer and not Johnson. 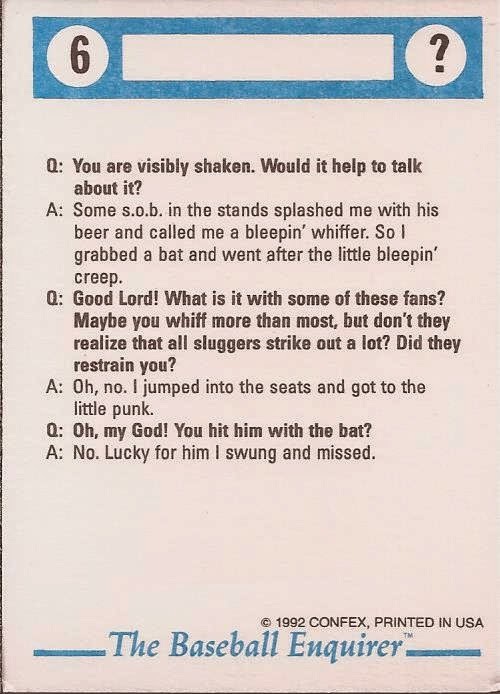 It's also interesting that the same year of that Enquirer broken bat card, Leaf released a card of Deer with the same shattered stick. To be fair, Deer had plenty of hair and often sported something of a mullet. 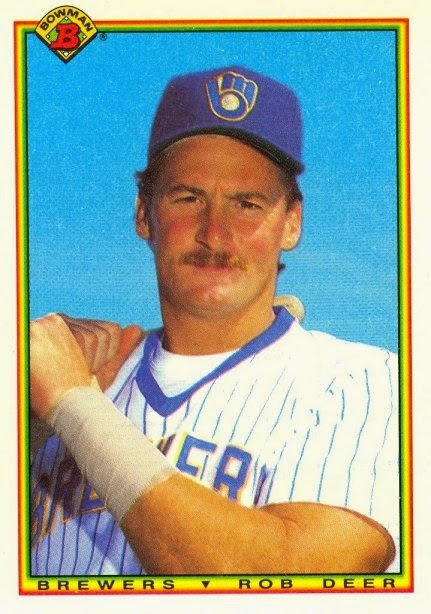 That 1989 Bowman card must be a photo taken the day after a haircut. Check out Deer on the cover of the April 27, 1987 Sports Illustrated for a fantastically glowing-in-the-sun mullet (the story was about the Brewers 13 game win streak to start that season). Good sleuthing! The Enquirer card also appears to have Tigers colors as part of the uniform too. I love this set even though sometimes the fake interviews sometimes got a little too personal. Also, excellent song choice to close - this track slays live! That's some fine detective work, gumshoe! I thought of Deer as soon as I saw it. Teamsets4u is a great site.. I've bought from them also .pretty good deals on team sets.